This one is for WWM/Wendy of One Can’t Get Over the Habit. 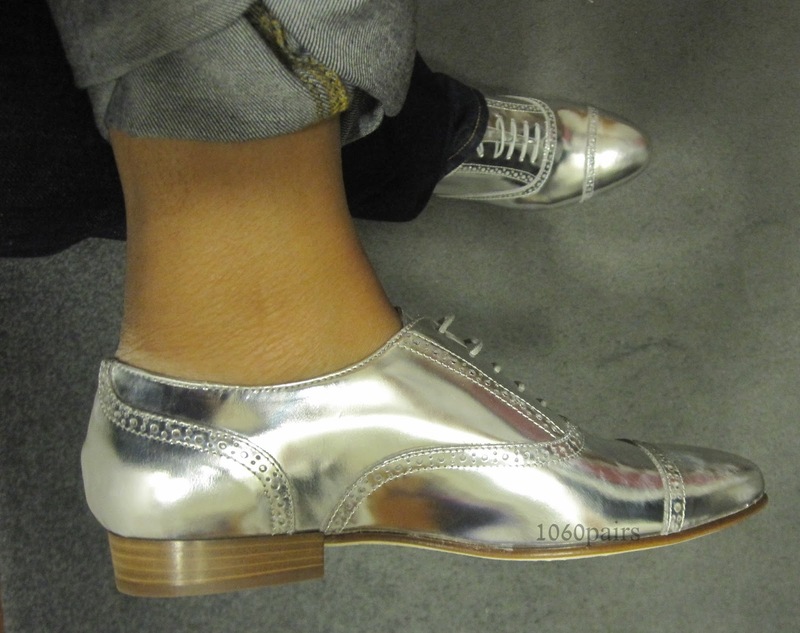 J Crew’s mirror metallic oxfords (04840, $288) run half sizes 5 – 9.5, then 10, 11 & 12. All sizes are on back order at the time of writing. They’re available in-store if you want to do a WWFIFY (we will find it for you). 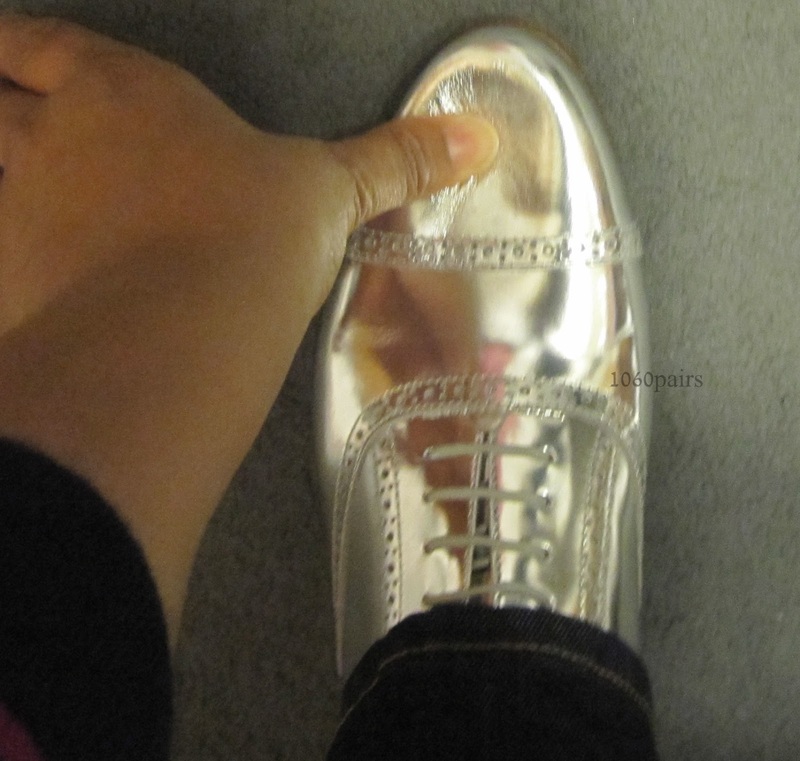 Size 8 – Bright & shiny. Definitely very, very shiny. I wear 7.5 and usually take 8 in J Crew shoes. Not these. I would definitely take 7.5. My toe is where my finger is. Well, toes, plural. I have all 5 on each foot. Too long in the front. Probably only good for the bunny slopes, but definitey a pair of skis on me. Side thumb. I’m not a big fan of how much the metallic glows. It’s a bit much for me. Perhaps because the shoe covers the whole foot. The mirror metallic is more subtle in strappy shoes or heels, like the Sloane pumps. I also didn’t like how long the front of the shoe is. Not even on super sale for me. Sam Edelman Jerome ($150) – These aren’t skis in the front. The length looks normal. I usually don’t like brown stacked heels, but I do on this shoe. Very shiny. Very cute. Also available in gold at Bloomingdale’s ($100). Sam Edelman Jayden (now $117.90) – Free shipping both ways at Nordstrom. The design has a lot going on. I prefer the one above. Nina Originals Etta (now $117.90) – Free shipping both ways at Nordstrom. This one looks a little long in the front length. Not quite as shiny as J Crew’s. Bass Ely-5 loafer ($87 at the moment) – It looks a little vanilla without the perforations. Jeffrey Campbell Lawford (now $37.95) – This is a gold, tassel loafer, but the sale must be shared. You can return sale items as Karmaloop, but for credit only. Steve Madden Repete ($129.99) – The color is called pewter. It’s photographing as closer to silver in some stock pics and more gold in others. It’s also available at Zappos (sale $116.99). And at Shoes.com ($129.99). You can usually find a code for shoes.com. Nordstrom will price match and they offer free shipping both ways. You can request a price match & order via chat, if you didn’t know. Whoah! 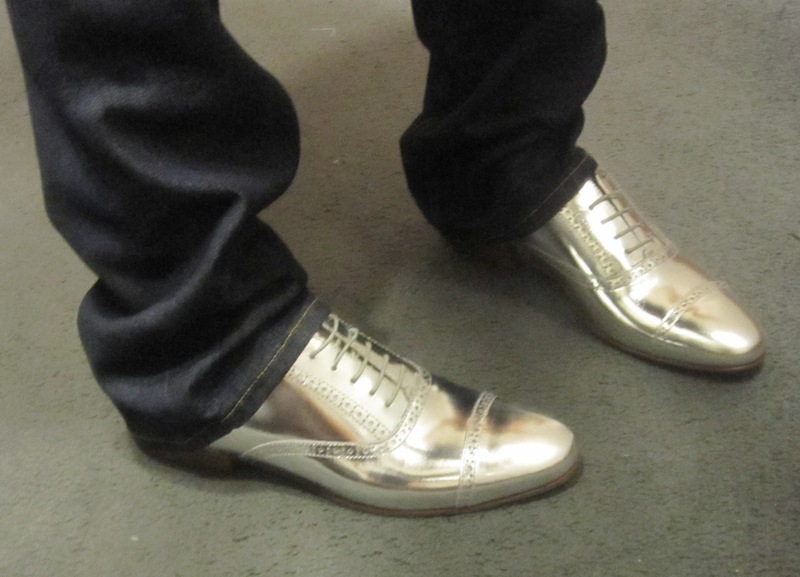 I love metallic shoes, and have definitely been tempted by loafers in the genre, but oh man those are shiny! Yikes! Too much for me, this mirrored stuff! 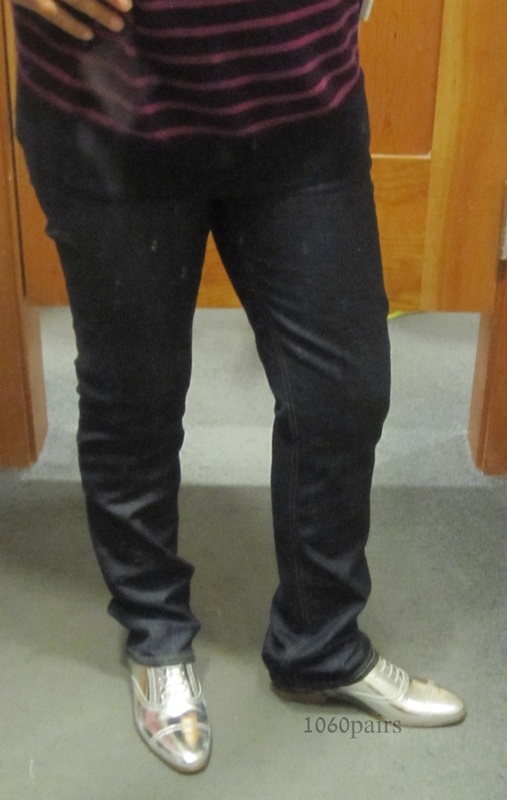 thatdamngreendress – I like the mirrored idea for oxfords, but it'll likely be a pass for me. I had half-hearted lust for them, I know that sounds weird but that's how I felt, and now crossing off my list and very content about that. Obviously I'd wear metallic shoes 😉 and have a few pairs already but in pumps. I'll have to find the not so shiny ones I got from boys' Crewcuts. Think that's the trick, the super shiny may be like white, can't help but make one's feet look big. On the upside though, I've found the mirrored finish to be good for not looking beat up. tiffany rose – "One! Singular sensation.." I just realized some of them remind me of dance shoes. I think the perforations make it less so. I've never looked at boys shoes. Thanks for the idea. Hi Gigi! Thanks for the review and the shout out! They are crazy long, aren't they? I think I may source the Edelmans in Canada now – much better price! I have the metallic kikis now and do love them. I am imagining wearing these with skirts and socks, but then, I am starting to get that "shut-in" style vibe going, shared by me and old ladies in assisted living facilities! God – is it wrong that I love the MJ image? WMM – You're welcome. If you have to pay for a return, I'm not sure these would be worth the try. I'd have to see the skirt/socks/oxfords. Could be a wee schoolgirl-ish. $0.02. 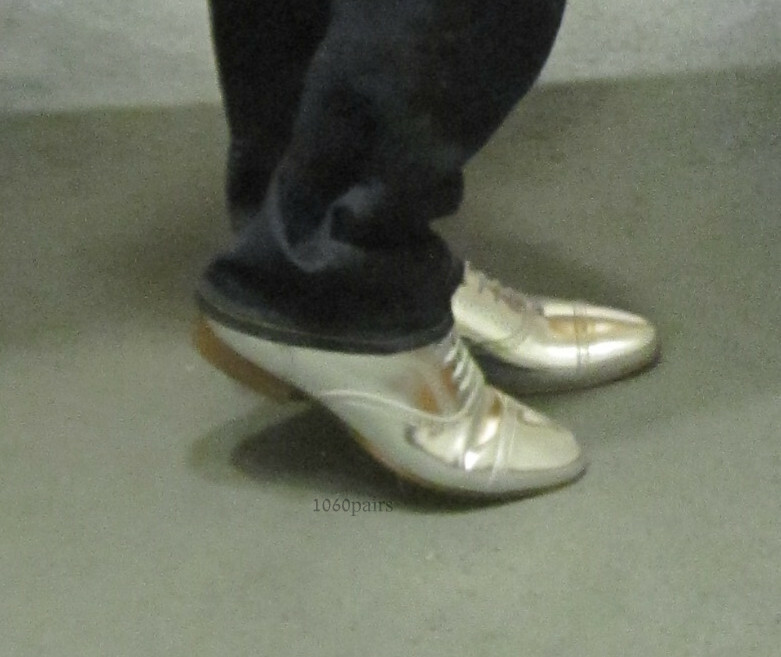 I'm a big fan of metallic shoes, and I like all the ones you posted. 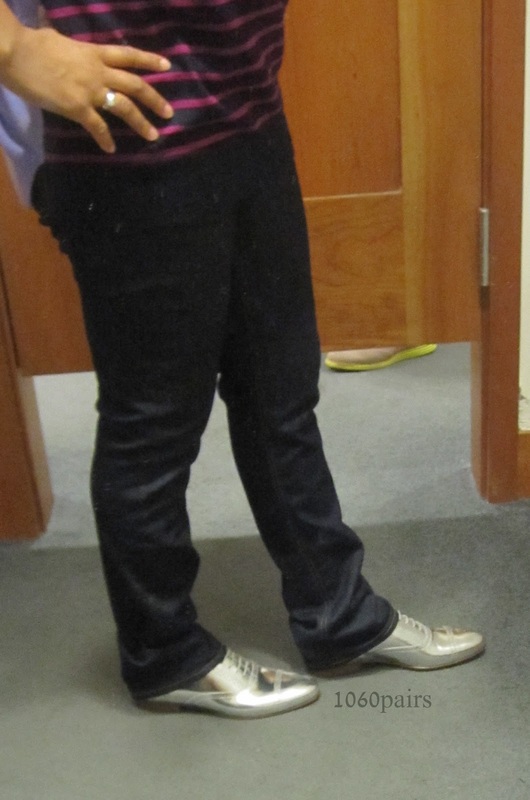 I wonder why the J Crew oxfords are so long! Did you try a size smaller? Maybe that would help? 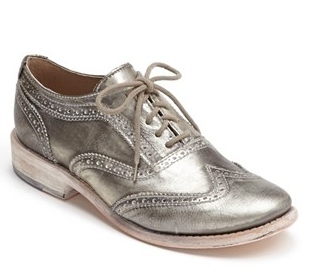 I just saw these on the Nordstrom's site, Steve Madden in pewter. They have a leather sole, too. Maybe they would be more to your liking, they don't look as shiny as J Crew. wowza they are sure reflective!! glad you reviewed this – what a shiny shoe. Having that much content do you ever have any issues of copyright infringement? My site has lots of unique material I’ve either written myself or outsourced but it appears a lot of it is popping it up all over the internet without my authorization. Do you know any solutions to help prevent content from being ripped off? I’d genuinely appreciate it. naturally like your website but you have to check the spelling on quite a few of your posts. A number of them are rife with spelling issues and I find it very troublesome to tell the truth nevertheless I’ll definitely come back again. I will immediately grab your rss feed as I can not find your e-mail subscription link or e-newsletter service. Do you have any? Kindly let me know in order that I could subscribe. Thanks. I found your blog web page on google and check a number of of one’s early posts. Continue to preserve up the really beneficial operate. I just further up your RSS feed to my MSN News Reader. Seeking forward to reading much more from you later on! I simply want to mention I am just all new to blogging and really loved your web blog. Likely I’m going to bookmark your website . You really have wonderful writings. Thank you for revealing your website page. I just want to tell you that I am just new to blogging and site-building and certainly savored you’re web page. Likely I’m want to bookmark your blog post . You actually have impressive stories. Thanks a lot for sharing your web site. I simply want to mention I’m new to weblog and certainly liked you’re web page. More than likely I’m going to bookmark your website . You really have excellent articles and reviews. Cheers for sharing your blog site. I just want to mention I am just all new to blogging and site-building and seriously liked this blog site. Probably I’m planning to bookmark your site . You surely come with tremendous articles. Appreciate it for sharing with us your blog. I just want to tell you that I am very new to blogs and seriously savored your web blog. Very likely I’m likely to bookmark your blog post . You definitely come with great articles and reviews. With thanks for sharing your blog. I just want to mention I am very new to blogging and site-building and certainly loved your web blog. Probably I’m planning to bookmark your blog . You amazingly have fantastic well written articles. Thanks a bunch for sharing your web page. I just want to mention I’m newbie to blogging and really savored this web page. Most likely I’m planning to bookmark your blog post . You certainly come with wonderful articles and reviews. Cheers for revealing your web site. I just want to tell you that I’m beginner to weblog and seriously liked your blog site. More than likely I’m planning to bookmark your blog post . You surely have beneficial posts. With thanks for sharing with us your webpage. I just want to mention I am just new to weblog and definitely enjoyed this web page. Probably I’m want to bookmark your blog . You definitely have terrific stories. Many thanks for revealing your webpage. I simply want to say I am very new to blogging and really loved this web page. Most likely I’m want to bookmark your website . You actually come with great posts. Thanks a lot for sharing your website page. Whats Going down i am new to this, I stumbled upon this I’ve found It absolutely useful and it has helped me out loads. I hope to contribute & assist different users like its helped me. Good job. I simply want to mention I am all new to blogging and truly liked your website. Almost certainly I’m likely to bookmark your website . You definitely come with impressive article content. Many thanks for sharing your website. A powerful share kalysdi, I simply given this onto a colleague who was doing slightly evaluation on this. And he in reality purchased me breakfast as a result of I discovered it for him.. smile. So let me reword that: Thnx for the deal with! However yeah Thnkx for spending the time to debate this, I really feel strongly about it and love studying more on this topic. If possible, as you grow to be experience, would you thoughts updating your blog with more details? It’s highly useful for me. Big thumb up for this weblog submit! Wow, wonderful blog structure! How long have you been blogging for? you make running a blog look easy. The whole glance of your site is fantastic, let alone the content material! Just desire to say your article is as surprising. The clarity in your post is simply great and i can assume you are an expert on this subject. Well with your permission allow me to grab your RSS feed to keep updated with forthcoming post. Thanks a million and please carry on the enjoyable work. Hey there! I simply wish to give you a big thumbs up for the great information you’ve got right here on this post. I will be returning to your site for more soon. This site definitely has all the information I wanted concerning this subject and didn’t know who to ask. Good post. I learn something new and challenging on blogs I stumbleupon everyday. It’s always useful to read through content from other writers and use a little something from their sites. excellent issues altogether, you just won a brand new reader. What would you suggest in regards to your submit that you just made a few days ago? Any sure? I have been exploring for a little bit for any high-quality articles or blog posts in this kind of house . Exploring in Yahoo I at last stumbled upon this web site. Studying this information So i am satisfied to express that I have an incredibly good uncanny feeling I discovered exactly what I needed. I most unquestionably will make sure to do not forget this web site and give it a look on a relentless basis. Hi there, There’s no doubt that your website could be having browser compatibility issues. When I look at your site in Safari, it looks fine however, if opening in I.E., it’s got some overlapping issues. I just wanted to give you a quick heads up! Apart from that, wonderful site! Good post. I learn something totally new and challenging on sites I stumbleupon every day. It will always be exciting to read content from other writers and use a little something from their websites. I quite like reading through an article that can make people think. Also, thank you for allowing me to comment! Can I simply just say what a relief to find someone that actually knows what they are talking about online. You actually realize how to bring an issue to light and make it important. More and more people have to read this and understand this side of your story. It’s surprising you aren’t more popular because you most certainly have the gift. Hi there! This article couldn’t be written any better! Looking through this post reminds me of my previous roommate! He continually kept preaching about this. I will forward this post to him. Pretty sure he’s going to have a very good read. I appreciate you for sharing! Very good info. Lucky me I found your blog by accident (stumbleupon). I have saved it for later! It¡¦s actually a great and useful piece of info. I¡¦m glad that you simply shared this useful info with us. Please stay us informed like this. Thank you for sharing.